Check back for updates on our progress, or sign up to receive updates by email. The Build Our Park fundraising campaign was on his screen for just a second, but something about its combination of words struck Douglas Byler as vaguely musical. "Over the next few days," he says, "this piece began to take shape almost subconsciously as the carefully crafted words morphed themselves into musical ideas." Through his composition, Byler celebrates the potential of a group of people coming together to accomplish a task. "Not only can such collaborative action bring about positive change in the town - in this case hopefully a new park - but the process draws people together in such a way as to create something even more valuable...a human community." Working together, our community can transform a piece of the downtown into a beautiful urban park and gathering place. Today, we are closer than ever before, and invite you to join in the movement. Make your donation. Together let’s build our park! Harrisonburg, VA – At the April 24th Harrisonburg City Council meeting, Build Our Park and Harrisonburg Downtown Renaissance Design Committee volunteers reported on the project status and presented updated conceptual designs. News Channel WHSV3 featured coverage of the presentation, viewable here. The complete presentation to City Council is viewable here on the City of Harrisonburg website. Harrisonburg, VA – Harrisonburg City Council has agreed to further explore an unsolicited proposal to build a downtown park from Build Our Park, a community-led nonprofit organization committed to facilitating the creation of a public park in downtown Harrisonburg. Build Our Park submitted a Public-Private Education Facilities and Infrastructure Act (PPEA) proposal for City Council’s consideration for a privately funded park on City property behind City Hall in the heart of downtown. The Commonwealth of Virginia enacted the PPEA process in 2002 to allow public and private entities to work in partnership on projects. 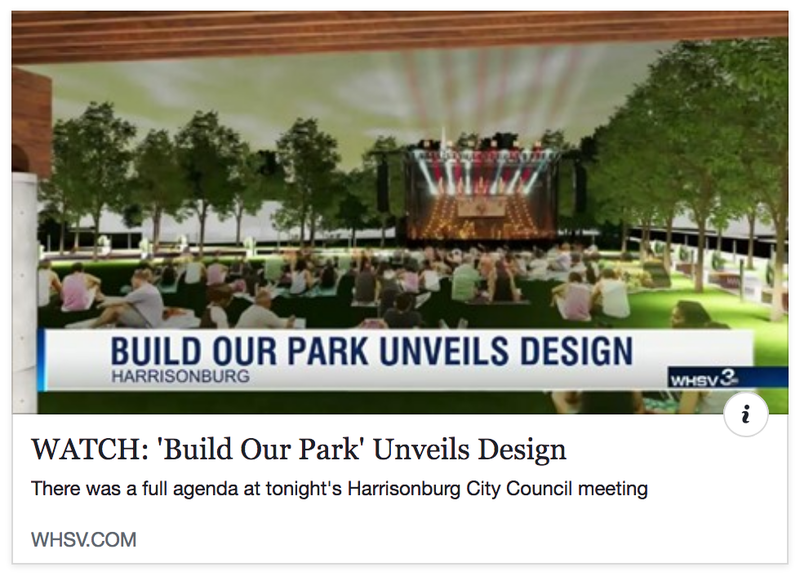 According to the Virginia Department of General Services, the Act “enables public bodies to partner with private entities to bring private sector expertise to bear on public projects and encourage innovative approaches to financing construction and renovation.” The Build Our Park proposal is considered unsolicited, as the City of Harrisonburg has not issued a Request for Proposals for a downtown park. However, Build Our Park has been working closely with members of City staff and City Council to plan and design the park. With the understanding that Build Our Park and the City of Harrisonburg need to formalize the process for bringing these plans to reality, city staff recommended that the Build Our Park organization move forward by submitting a formal proposal to proceed with the project via the process outlined in the Public-Private Education Facilities and Infrastructure Act of 2002. City staff presented City Council with the PPEA proposal during “Other Matters.” In a procedural context, City Council members agreed to further examination of the proposal. This move allows the project to enter into an interim-planning phase with City staff. The City is now required to publish notice of the unsolicited proposal and accept competing proposals during the next 45 days. By accepting the Build Our Park proposal, City Council is not approving the park project, but is triggering the next step in the process. During this time, City staff may review the proposed project and may negotiate an interim agreement with Build Our Park. After 45 days, the City will decide to either proceed with the second review stage or to not proceed further with the proposal. If the City ultimately decides to work with Build Our Park on the project, they will enter into a comprehensive agreement where details will be determined regarding potential bonds, insurance, and terms and conditions. The Build Our Park Board of Directors has been working with City staff to plan the park’s new design and would continue to work with them to plan the park’s construction as well as on-going maintenance and operations. During this process, fundraising for the park has been on hold. On April 18, the organization looks forward to restarting its fund- raising effort in conjunction with The Community Foundation’s Great Community Give. The Great Community Give is a single day of giving aimed at promoting charitable giving in Harrisonburg and Rockingham County. Through this initiative, the entire community will be invited to support Build Our Park and other nonprofits that meet needs, enrich lives, and build a community we can all enjoy. As Harrisonburg’s downtown continues its reemergence as a dynamic environment in which to live, work, eat and shop, the thoughts of many have turned to the need for more public green space for gathering in the City’s core. The downtown park’s concept features a multi-use path, expanded pavilion, open space, play area designed to resemble nature, pergolas for shade, and splash fountains. It will incorporate the area adjacent to the Turner Pavilion that currently is used for community programming and events. The park would be designed to be flexible to accommodate a growing farmers market, public events, community gatherings, and wellness. On April 18, as part of the Great Community Give, you are invited to point, click, and give to support the mission to create a privately funded park in downtown Harrisonburg. Throughout this exciting day of giving, Build Our Park has the opportunity to earn extra funds from a list of Great Community Give prizes. You can help Build Our Park earn a $2,000 prize by getting the Most Donors between 7-8 a.m. Later in the day, Build Our Park can earn a $2,000 prize by aiming for the Most Dollars Raised between 7-8 p.m. At the end of the day, additional prizes of up to $8,000 will be awarded to the organization with the most dollars raised and with the most number of donors. Every dollar and every donation helps! Ready to help? Point. Click. GIVE!